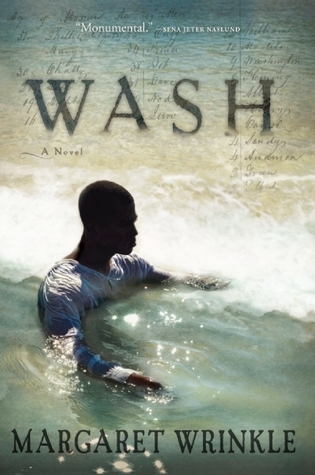 Wash by Margaret Wrinkle is a terrific book. First, some disclaimers. I was in a workshop at the Tinker Mountain Writers Workshop with Margaret several years ago where I first read a piece of this novel. I don’t know if that piece even survived, but I knew back then that this would be a great book. We’ve stayed in touch and last week managed to hang out together some at the AWP Writers Conference in Boston. Second, although I would have read it anyway, the reason for reading the book now is that I am moderating a panel next week at the Virginia Festival of the Book featuring Margaret and three other novelists. The novel is primarily set in 1823. Wash is a slave owned by a man named Richardson, an extensive landholder. Richardson doesn’t treat his slaves as badly as some owners do, but he still considers them his property, not much different from his horses. In fact, he has hit upon a scheme to raise some much needed funds by selling the services of Wash as a stud, to breed more slaves. The relationship–not too big a words–between Wash and Richardson forms the heart of this powerful book. And it is a relationship that begins even before Wash is born, because Richardson’s purchase of Wash’s mother at auction is based on a connection between them, described in the early pages of the book. Another important element here is the tie between Wash and another slave, Pallas, a mysterious bi-racial woman. But obviously the breeding of slaves is a tough subject for a book, but this one does it beautifully. We see that it is at once dehumanizing, but is also a basic human function, the result of which is new human beings. There is much to discuss here, and I’m looking forward to the panel next week.